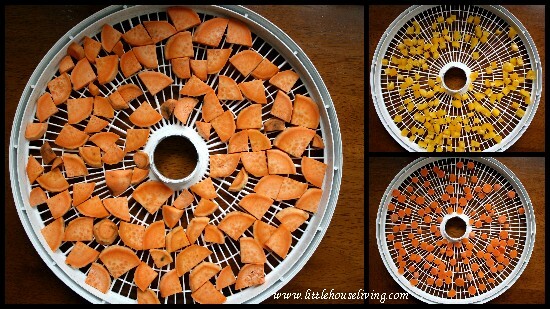 Dehydrating vegetables is an easy way to preserve large amounts of fresh produce. Unlike canning, it does not require special equipment (aside from the dehydrator), there are no issues about food safety, and the finished product takes up hardly any space. Don’t get me wrong, I typically prefer canning. But as many vegetables require pressure canning to remain shelf-stable, and I do not half a pressure canner, dehydrating becomes the best option for me. While dehydrating does limit the usefulness of the vegetables, it is still a great method to have on hand. 1. All pieces should be the same size and thickness. 2. Vegetables should be thoroughly cleaned and free of blemishes. I prefer to use an electric dehydrator instead of the oven, as it provides more consistent temperatures and air flow (though you can certainly use an oven if you wish). One benefit to using a dehydrator is that most units contain a fan that circulates air around the vegetables, helping to push away moisture. Most vegetables are dried at 125 degrees for 4-14 hours. However, I find that particularly moist vegetables, such as bell peppers, take considerably longer. The peppers in this post took about 24 hours, while the carrots and sweet potatoes took 16 hours. All times are dependent on the moisture content and size of the food and can sometimes differ from batch to batch, so just keep checking until they are done. It is good to note the ambient humidity as well, as that can also affect drying time. Produce must be pretreated by steam blanching to prevent continued ripening. Simply prepare and chop vegetables as necessary, then steam for 3-4 minutes. I like to then spread them out on a kitchen towel to get off as much moisture as possible before placing in the dehydrator. That’s basically it! The Ball Blue Book Guide to Preserving has a lot of great information about all kinds of preservation techniques, from pressure and water canning to freezing and dehydrating. It is really a necessity for any home preserver. Need something else to dry? Next you can trying Dried Chicken Broth! Have you ever dehydrated vegetables? Which are your favorite vegetables to dry? I have been reading and thinking about getting a dehydrator. Is there one you recommend? Sandy, I personally have an recommend a L’Equip Dehydrator: http://amzn.to/16QuG9I (I have the Filter Pro but they do have a regular one too). I love it. It’s easy to clean and I like the rectangular trays versus round for things like jerky, fruit leather, ect. The thing I like about the L’Equip is that you can set an exact timer! I have dried celery and parsley leaves in the oven. I did have a dehydrator but now my daughter has it. It is only the 2 of us now and my hubby is a very picky eater so going to all that work to can and dry garden produce that he doesn’t eat is a waste of my time. We are at that time in our life where we enjoy going out to eat and taking 1/2 of it home for another meal the next day. I have never blanched my veggies before drying them and they seem to come out fine. I dry LOTS of spinach and then I can sneak it into food without the children complaining about eating it. They don’t know if that’s parsley or spinach in the lasagne. Another good mix is to dry onions, celery, parsley and carrots. After they are dry put them in the blender/food processor and pulverize it. It makes a nice seasoning for meats in the crockpot. If you’re looking for a way to save money and also a way to make food from scratch, investing in a food dehydrator is a sound investment. Learning to use your food dehydrator is both fun and informative. The foods you can dry and the recipes will keep you busy for a long, long while. 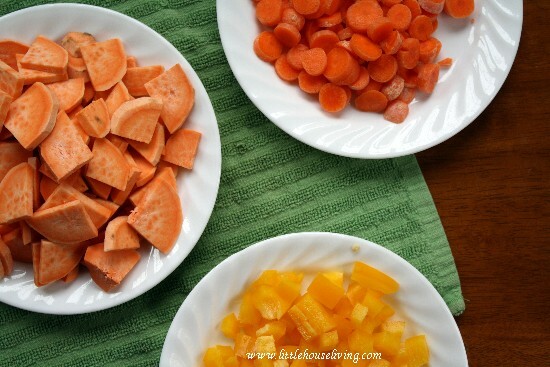 Once you have dehydrated the vegetables can you use them in slow cooker recipes? Most of the recipes I do will cook for 8-10 hours and then stay on warm till I get home up to 4 hours or so. Yes you can! They work great for that. When you rehydrate your food to eat it is there any texture change? I’m thinking of starting dehydrating and thats the only concern I had. There is some texture change but it just depends on what you want to use the foods in for you to even notice. Generally we use the rehydrated vegetables in soups so you can’t tell the difference. I wouldn’t use them in something like a stir fry.